Where is the pineal gland? The pineal gland is considered part of the epithalamus, which is one the main structures that makes up the diencephalon. 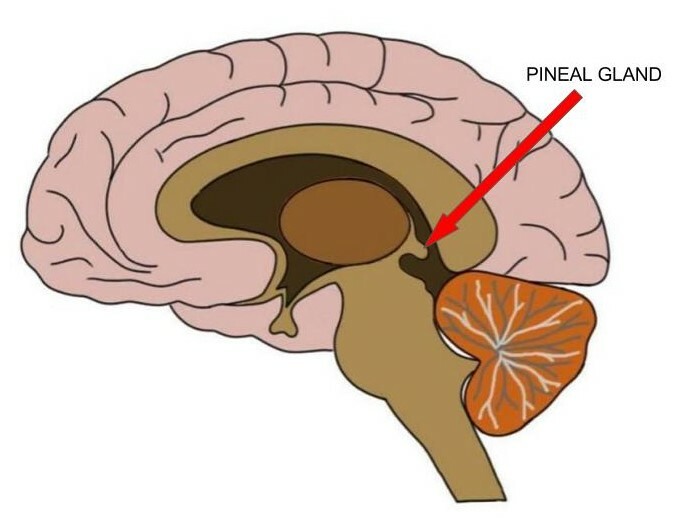 The pineal gland was so named because it has a pine-cone like appearance. Unlike many structures in the brain, the pineal gland is unpaired; in other words, many brain structures like the hippocampus or amygdala are symmetrically paired with another copy of the organ in the other hemisphere of the brain. There is only one pineal gland, however, and it sits right on the midline of the brain. What is the pineal gland and what does it do? The solitary nature and unknown function of the pineal gland contributed to the French philosopher Renee Descartes calling it the "seat of the soul" and suggesting it was the place where the immaterial soul communicated with the physical body. Descartes' ideas about the pineal gland were never widely accepted by his contemporaries, however, and today the function most frequently associated with the pineal gland is the secretion of the hormone melatonin, which is involved in the regulation of circadian rhythms. There are no neurons that leave the pineal gland to carry signals to other areas of the brain. Instead, the main output of the pineal gland--and the way it communicates with the rest of the nervous system--is melatonin. The pineal gland is made up primarily of secretory cells called pinealocytes, which secrete melatonin at varying rates throughout our 24-hour cycle. The highest rates of melatonin secretion occur in the middle of the night; they begin to decrease as it gets closer to dawn. This schedule of melatonin release is maintained based on information about the amount of light in the environment that the pineal gland receives from the retina. The retina sends this information to a nucleus in the hypothalamus called the suprachiasmatic nucleus (SCN), and from there it takes a convoluted path to the pineal gland. Watch this 2-Minute Neuroscience video to learn more about the pineal gland. In addition to sending information about ambient lighting to the pineal gland, the SCN also controls circadian rhythms. The SCN has receptors for melatonin, and it uses the melatonin signal to attain information about the time of day. Because melatonin levels are highest during the hours of darkness, the SCN can use melatonin activity as a sign that our circadian rhythm should be in its nocturnal stage. In this way, melatonin secretion can act as an important indicator if one's circadian rhythm is not in sync with the environment (e.g. if high levels of secretion are occurring but the person is still wide awake). This happens when, for example, someone has to adapt to a new 24-hour cycle after flying across several time zones. Exogenously administered melatonin, in fact, has been explored as a way of speeding up the process of adapting to a new sleep-wake cycle, with some success. Just as melatonin secretion can provide information about the time of day, the nightly duration of melatonin secretion can provide information about the season of the year. Because longer periods of darkness occur in winter, the duration of melatonin secretion at night in the winter is slightly longer than it is in the summer. This is used as a signal in animals that are considered photoperiodic, meaning they experience biological and behavioral changes in response to the changing seasons. For example, many rodents suppress sexual activity during the winter months; it has been shown that removal of the pineal gland in rodents prevents this suppression from occurring. This suggests that melatonin secretion from the pineal gland serves as a sort of biological calendar in rodents, in the process helping to regulate their seasonal behavior. It is not clear that this function for melatonin has a great deal of relevance for humans, who are not considered photoperiodic. However, due to the onset of depressive symptoms during winter in those with seasonal affective disorder, abnormal melatonin secretion has been suspected as playing a role in the disorder, suggesting that it is within the realm of possibility that seasonal changes in melatonin secretion also affect human behavior. Due to its close association with nighttime and circadian rhythms, melatonin has been investigated as playing a role in promoting sleep. Some have hypothesized that melatonin secretion may facilitate sleep by inhibiting activity in the SCN that promotes wakefulness. However, the true relationship between melatonin and sleep is unclear. In nocturnal animals, melatonin levels are still highest at night, suggesting a role for melatonin in circadian rhythms that does not necessarily involve sleep regulation. Many studies have investigated the effects of administering melatonin on sleep, and although there are some indications it may be effective in treating mild sleep disturbances, the results have been mixed (for example, see Ferracioli-Oda et al., 2013 and Buscemi et al., 2005). Proper levels of melatonin secretion are important for human health, and the hormone is involved in a wide range of processes not discussed here. Perhaps because the pineal gland is highly specialized, focusing only on melatonin secretion, its importance is sometimes overlooked. The significance of melatonin in maintaining circadian rhythms, however, and the pineal gland's role in producing it, suggest that the pineal gland is an essential structure for the health of the central nervous system. Sapède D, Cau E. The pineal gland from development to function. Curr Top Dev Biol. 2013;106:171-215. doi: 10.1016/B978-0-12-416021-7.00005-5.